Lily's Quilts: Elephant In My Handbag Giveaway! Elephant In My Handbag Giveaway! Today we have a £25 gift voucher giveaway from my newest sponsor, Elephant in my Handbag. 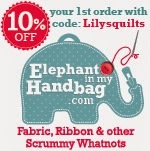 We also have a voucher for 10% off your first order at Elephant in my Handbag using code Lilysquilts. EIMH is a family owned craft and fabric business based in Hawkhurst in Kent in the south east of the United Kingdom. Their mission is to find interesting and exciting things for their customers to use to create unique projects. They are a Top Rated Seller with over 2,000 positive feedbacks on eBay and have over 11,000 likes on Facebook. They have sold to countries all around the world from Chile to France, Russia to Australia - if you want references, just ask! For a chance to win the voucher, leave a comment letting me know which is your favourite fabric at Elephant In My Handbag. Those are some really beautiful bundles. HELLO, Love the Gingerbread Nutcracker Bundle! Love all the elephant fabrics. 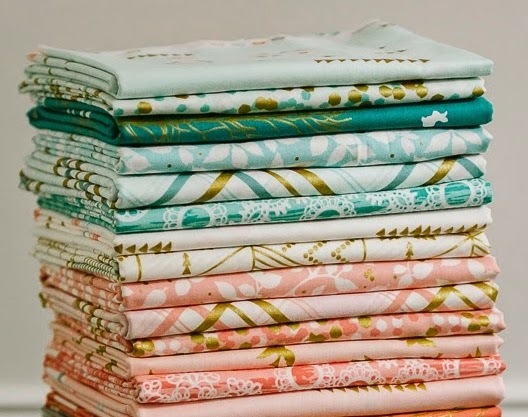 I love that they have Moon shine from Tula Pink, but just spotted a great bundle lovey dovey with very cute pink fabric. Thanks for the introduction and the give away. I like a lot of the fabrics they stock but the one I love is the Tilda, Winter Memories, grey. I love the Origami Oasis Border print, would make a gorgeous pillowcase for my daughters birthday next month! I just need the Black cats fabric. Well, I was lucky enough to participate in their Market Sale yesterday and was able to put my name on four fabrics I really liked. My favorite one has elephants including young ones that seem to be looking at you from the fabric. It's so cute! I can't wait to do something with it. They have a great selection of top fabric designers that I'm used to seeing with a lot of fabric that is different and unique. I would really love to win a gift from there! A Beautiful Thing in blue is so pretty. Has to be the woodland fabrics -Lewis and Irene -fab. Wow - hey are so close to where I live and I didnt know - how did that happen!!!! I like flower heads by Michael miller. I like Birch Farm by Joel Dewberry! Moon Shine is some of my favorite fabric line right now! Love to hear about new fabric shops in the UK. Those Scandi Christmas Grey fat quarters are really calling my name at the moment! My favourite at the moment is Birch farm. Thanks for the chance to win. The tula pink would have to go on my list ... Those tents are just so me! This is kind of an impossible question but I'm going with Brambleberry Ridge. Thanks for the giveaway! All the elephants are great! Its a toss up between Sewing Notions and Scandi Christmas Greg!!! Beautiful shop and something there to please everyone!!! I like the butterfly spots fabric by Tula Pink, especially in blue! Great sponsor! I like "Scandi Christmas". I really like the coated cotton - bikes on red! Great shop! I loooove this Bundle! the "Havana" Floral Buttons Birds Organic Cotton Fabric Bundle"
White Cameras in the Snapshot line by Riley Blake - I would love to win some of that to back a special quilt with. Thanks for the giveaway opp. Moonshine!! Great web site....great giveaway. I love Enchant tea party - blue! Congratulations on your new sponsor, Lynne. I like the Birch Farm collection; just right for spring. What a great range and reasonable prices too. I liked toadstools on Brown by Lewis and Irene. Love Toadstools on Taupe, very autumnal! Wow! If anyone is looking for a good collection of Christmas fabrics they've got it. My favourite fabric is blue floral Scandi from the Copenhagen collection though. Thanks for the intro to another fabric shop, you enabler. I like "Blue Green Trees Leaves" by Birch... Thank you! I really love that "Deer Forest" bundle. Such fun colors! I like the Small Floral Teal Blue Brown. Fab looking shop. I love the tula pink bundles. I love the Wee Wander panel in pink - it would look lovely in a quilt for my youngest niece!! Thanks for the giveaway and discount code! I love Christmas Baubles in Blue. Owls Floral in Green (Freespirit)! Love the lime green in this bundle! My favorite is the Brambleberry Ridge collection. Love the metallics! I love the "20/20 glasses" by Michael Miller - fun! 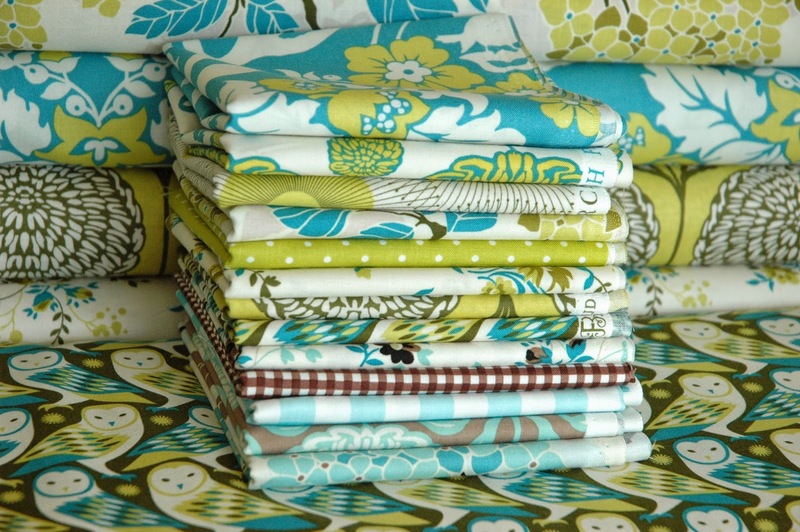 I like the "Camping Woodland Blue Bundle"
I love all their fabric oh my word! especially the animal prints!!! So many lovelies! I love the color of "Yellow Spots" Flurry Spotty Fabric by Dashwood Studio. 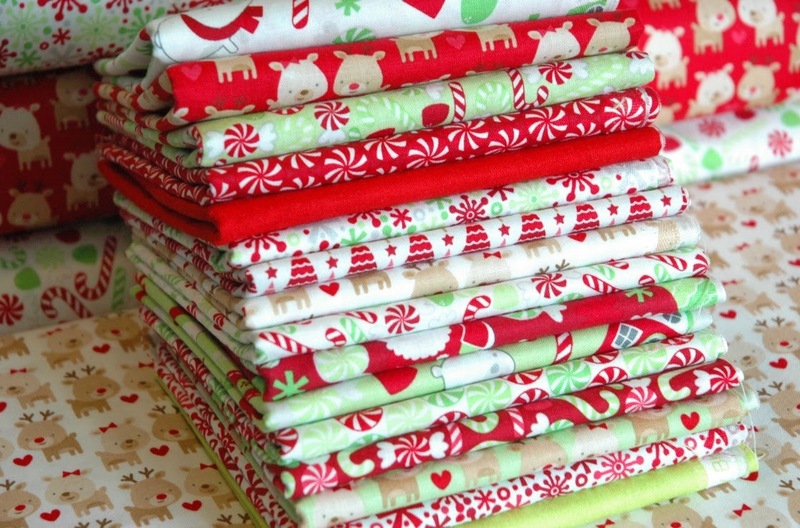 I am into the christmas fabric right now so I would choose the Ginger Nutcracker bundle. Thanks for the chance. Thanks for the giveaway, I love EIMH. The Moonshine range is beautiful. I love the Fox Playground Animal Toss White" by Freespirit. Adorable! My favorite fabric is the Trees on Red from the Woodland Tree Autumn Line. I am currently drooling over the origami animal line by Michael miller. Love love love!! This is a hard choice! Would be hard pushed to decide between any of the plush or flannels. Too hard to choose so would have to buy both! "Treelicious" in blue and red Christmas bundle. Getting a head start on those holiday projects this year I swear:) Thank you for introducing Elephant in my Handbag, cool shop. I like the Forest Woodland Pink by Tula Pink and the Birds Peach Pink Brambleberry Ridge Metallic. I love woodland purple toadstool by Michael Miller. Thanks for the give away. I almost finished my timeconsuming study. I would love to sew again! I really like the Sail Labels by Rosemary Lavin. I've been looking for these for ages to go into another yottie quilt! I like the "Dinosaurs Volcanoe Blue" Jurassic Coast Fabric Bundle by Lewis & Irene. My favourite is Christmas Deer Woodland, so kitsch, I love it! I love the Girl Crazy Pink by Riley Blake. So many fabrics to choose from. Thanks for the chance. I am in love with the Moon Shine collection by Tula Pink in woodland blue right now. Just loving the colorful animal print border, origami line. 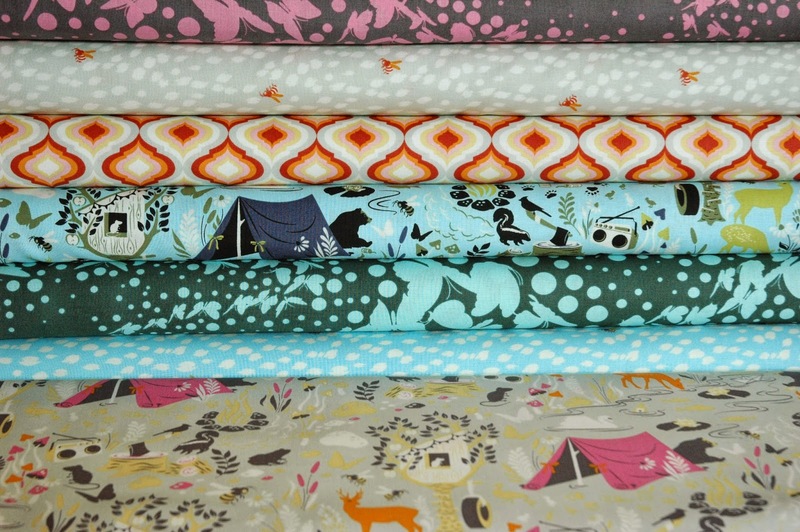 Fox Woodland is gorgeous but lovely selection of fabrics at that website!!! "Trees on Green" Woodland Tree Autumn Fabric caught my eye today. I love the Home for the Holidays line.